Harrow Road is an ancient route running from Paddington to Harrow. Before 1800 what is now known as Maida Hill and Maida Vale was covered in fields, with grazing cattle. Through the meadows ran a stream called the River Westbourne. 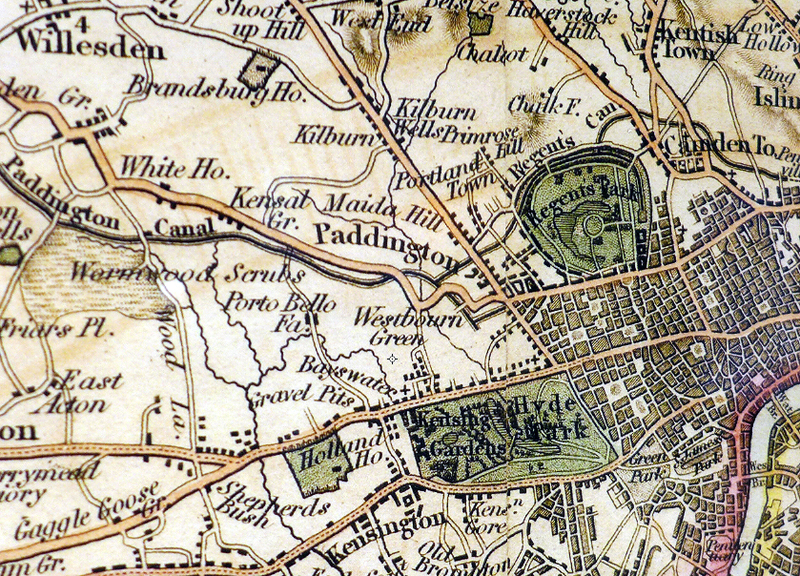 The opening of the Grand Union Canal (Paddington Branch) in 1801 led to the first villas being built on Hill House fields, the highest part of Paddington, 37m above sea level. In 1810 a pub opened at 435-437 Edgeware Road called ‘The Hero Of Maida” – referring to Major General Sir John Stuart, who in 1806 led British troops to victory over a larger French force on the plain of Maida in southern Italy. In 1828, apart from a short row of houses at Orme's Green in Harrow Rd (probably built by Bond Street print seller Edward Orme, who was building around Bayswater from 1809), the countryside remained open. 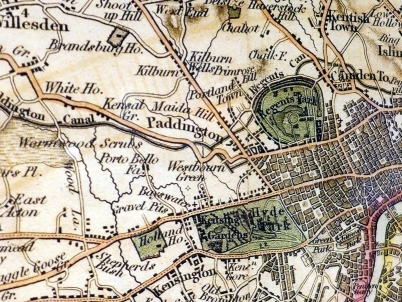 The north-western part of Paddington parish was still rural in 1840. In the first half of the 19th Century Maida Hill East and Maida Hill West referred to the area now known as Maida Vale, and belonged to the Bishop of London. Most of the parish west of the Westbourne stream was within Westminster Abbey’s Westbourne manor. Part of Queen’s Park belonged to All Souls' College, Oxford. In the late 1850s the River Westbourne was piped underground. Building spread northward from Westbourne Green during the 1860s. By 1865 the name St Peter’s Park, commemorating the lordship of Westminster Abbey, was given to a projected suburb north of Harrow Road. A few straight avenues leading from Harrow Road had been planned, although not yet built up: Malvern (soon renamed Chippenham) Road, an extension of Elgin Road, St. Peter's (renamed Walterton) Road, and the southernmost stretch of the future Fernhead Road; to the west, part of Ashmore Road, as yet unnamed, had been begun. In 1865 Sir John Neeld made the the first leases (99 yrs), on the nomination of Edward Vigers, a builder or timber merchant of Tavistock Lodge, Great Western Road. They were mostly for terraced houses of three storeys over a basement along the north side of Harrow Road, forming Chippenham Terrace, and in Marylands Road, and for two-storeyed houses in Chippenham Mews. The Goldney family, some of whom were Wiltshire neighbours of the Neelds, was also involved. By 1869 there were houses along much of Chippenham Road and at the west ends of Elgin Road, where St. Peter's church had been allotted its existing site, Marylands Road, and Sutherland Gardens. All three roads led towards Shirland Road, which approximately followed the line of the Bayswater or Westbourne stream. Most of Goldney Road had been built up. Neither Fernhead nor Ashmore roads stretched very far, but Saltram Crescent had been planned to run north to Kilburn Lane. There were houses on the west side of Shirland Road, at the south end, by 1870. Vigers, who had been speculating in land in north Kensington at the west end of Westbourne Park Road since 1860, found the building of St. Peter's Park a risky enterprise. He had to construct roads and sewers, besides a bridge over the canal (Carlton bridge), which would provide access by omnibus but which caused a dispute with the vestry about rights of way. Some of the small builders to whom he had subleased were in trouble from 1868, Vigers himself was forced to negotiate a further loan in 1870, and over a quarter of the builders on the estate failed between 1870 and 1872. Building activity revived in the mid 1870s, after Vigers's bankruptcy had been averted by the Neeld trustees. In 1886 the northern parts of Ashmore and Fernhead (then to be called Neeld) roads had no buildings, except St. Luke's church between them by Kilburn Lane, and neither had Saltram Crescent. There were still gaps along the middle stretch of Saltram Crescent and to either side of Marban Road, leading west from Fernhead Road, in 1891, although they had been filled by 1901. St. Peter's Park was begun with some substantial terraces near Harrow Road. Parts came to suffer from a cramped layout, however, and much housing was soon neglected. Walterton Road in the 1880s had bay windows, many with cards advertising services 'from the letting of lodgings to the tuning of pianos'. Subletting had led to deterioration throughout the area by the 1890s, although there was little real hardship. In the eastern part well-to-do households lined Sutherland and Elgin avenues, as in the Maida Vale stretches of those roads, and Harrow Road and Grittleton Road. There were also some well-to-do residents in Marylands Road and its southern offshoots, and in Chippenham and Walterton roads. Elsewhere, including the slightly newer part west of Chippenham Road, residents were 'fairly comfortable'. Houses were mostly of nine rooms and might be let to two or three families, often clerks, agents, or well paid artisans. In 1901 the area came under the metropolitan borough of Paddington, administratively the Harrow Road Ward. Between 1918 and 1939 the name St Peter’s Park fell into disuse. After World War II parts of St Peter’s Park was cleared for municipal housing. In 1953 the London County Council (the LCC) bought the Walterton estate, built between 1865 and 1885, from the Church Commissioners. During the 1950s, private landlords, including the infamous Rachman, bought up tail ends of leases due to expire in 1964, the LCC inherited a rundown, overcrowded estate where many homes lacked basic amenities. During the1960s the Greater London Council built tower blocks and low rise blocks on the Elgin Estate. In the early 1970s the sheer volume of derelict homes gave rise to the high profile Elgin Avenue squatting campaign, involving such figures as housing campaigner Piers Corbyn and punk legend Joe Strummer of the Clash. More than half of the homes on Walterton were demolished during this time with the remainder of around 360 houses being “reconditioned” to a fifteen year life. In 1980 ownership of the area transferred from the GLC to Westminster City Council. In 1985 WCC decided to sell off the estates to private developers, without consulting or even informing the residents. Residents responded by forming the Walterton and Elgin Action Group (WEAG), organising protests, petitions and their own plan to save the homes of local people in need of rented housing. In 1987, WCC proposed to dispose of a large number of homes in the private market, so they didn’t re-let any flats that became vacant. By the middle of 1988 one third of Walterton Estate homes were empty and blocked with steel doors and Hermes and Chantry Points were heavily squatted. In 1988, the WEAG began the process of transferring ownership of the estates to the community. 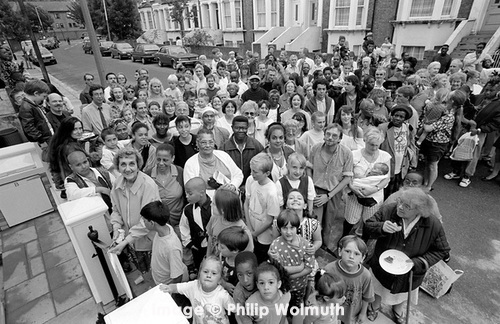 In April 1992 residents took over ownership and control of 921 homes. After negotiating funding from WCC, WECH rebuilt and refurbished properties that had suffered years of neglect. Two tower blocks were demolished and replaced with low rise homes. Despite turbulent relations with the local authority before 1992, WECH has since worked closely with Westminster Council. WECH is now a beacon of how resident control can not only revitalise the physical environment of run down estates but also create sustainable and inclusive communities from the bottom up. The poet Francis Thompson (1859-1907), lodged in Fernhead Road and, from 1897, with different landladies in Elgin Avenue and its neighbourhood. 91 Fernhead Road was the birthplace and childhood home of the comedian Norman Wisdom (1915 – 2010). Artist, children’s illustrator and creator of children’s books. Maida Hill has a fascinating modern history of music, dance, culture, and counter-culture; from the punk days of Joe Strummer, through Afro-Caribbean rooted reggae, to the Notting Hill Carnival. Pre-punk rockers the 101ers took their name from the house number of their squat in Walterton Road, now replaced by a low-rise block of flats. The band played a weekly residency at the nearby Chippenham pub. Joe Strummer left the 101ers to found The Clash. The 101’ers played an Elgin Avenue squatters’ benefit at the Chippenham Factory in Chippenham Mews, where John Phillips printed 101’ers and 70s Carnival posters. The former factory became the Notting Hill Carnival base on the Harrow Road. John Phillips went on to the London Print Studio along Harrow Road and the Chippenham Factory transformed into the Yaa Centre. The Windsor Castle (309 Harrow Road) was a punk/rock venue in the mid to late 1970s. Playing there, among others, were Dr Feelgood, The Jam, the Psychedelic Furs. British Reggae band Aswad had their own Grove Music label at 425 Harrow Road (now the London Print Studio). Their manager, Michael ‘Big Dread Grove Music’ Campbell was described as the ‘Buddha of Ladbroke Grove/Harrow Road’ in the music press. Mute Records was based at 429 Harrow Road.